A few days after I started working for Knit for Peace I was invited to attend the Knitting Medley at the University Women’s Club. I have to say I was somewhat nervous at the prospect of double-knitting as the first session of the day – I had only ever been a very basic knitter and I hadn’t done any for thirty years. I could remember how to cast on and cast off and knit/purl. I didn’t need to worry! The Drawing Room of the club was a perfect setting for the group, comfortable and quiet and the club kindly provided a large table for us all to sit round. 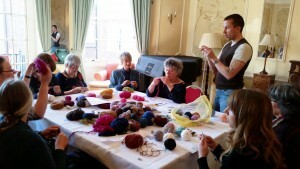 Nathan Taylor was a charming and engaging tutor – kicking us off with an enthusiastic explanation of double-knitting and why he was so hooked on it. He then helped us to get started. I have to say I gave up on the ‘invisible cast-on’ method at the time, but I have since followed it on line and have semi-mastered it. You can find his wonderfully clear instructions on his YouTube channel here. 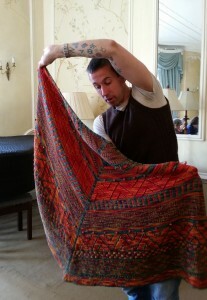 And more of his work and patterns on Ravelry here. Not knowing my way round a knitting pattern my swatch with a heart on it was more a swatch with a heart-beat graph on it – but it didn’t matter – it was such fun to sit and knit and chat with the other knitters. Even though many people already knew each other, I immediately felt at home and over the course of the weekend enjoyed a lot of interesting conversations and quite a lot of laughs. After a delicious lunch we headed off to the Victoria & Albert museum for a guided tour of knitted (and knitting related) exhibits. Our lovely guide, Jane, had put real effort into finding out all the little hidden bits of knitting on display – from tiny knitted gloves on dressmakers’ show dolls (from the 18th century) to Tudor knitted caps, we also got distracted by Coptic embroidery and Indian quilts, we ended up in the jewellery gallery looking at knitted jewellery (I have to confess some of us were also distracted by other gems! ), and this proved a useful preparation for the workshop on crocheted jewellery with Katy Bevan on the Sunday. For many, one of the highlights of the weekend was the talk given by Dani Liebeck who showed some of her collection of beautiful knitted scarves which form part of her 365 scarf project. I thoroughly enjoyed the weekend and am now hooked. I went off straight after the first day and bought more wool and needles so that I could practice double knitting at home – I’ve only been at Knit for Peace for two weeks and I already have three knitting projects on the go!